Dr. Ulrich Bez is a character. As evidence, when his mobile phone rings, the James Bond theme reverberates loudly enough for anyone within shouting distance to take notice. There’s a reason for this, of course; the phone in question, a Nokia 8800, was released a few years ago as part of a co-branding agreement with Aston Martin—the company for which Bez serves as chief executive officer. The ring tone is attention grabbing, to be sure. It’s also a pitch-perfect statement for a man who: a) is enthralled with all things Aston Martin, and: b) walks into a room and commands attention better than most. Women don’t necessarily swoon in his presence, martini shakers don’t swing into action, and bad guys don’t scurry for the shadows, but Dr. Bez has more James Bond about him than the average auto executive. After all, how many 66-year-old CEOs play an active role in their company’s racing programs? For the past four years, Dr. Bez has done exactly that, driving for the factory Aston Martin team in the 24 Hours of Nürburgring, one of the most gruelling races on the motorsport calendar. In May of this year, he raced there again, behind the wheel of the brand new Aston Martin Rapide—arguably the company’s most exciting car since the DB5 debuted in 1963 and went on to star alongside a certain secret agent in the classic film Goldfinger. It must also be noted that Dr. Bez is an engineer by trade and, more pointedly, not an accountant. Earlier in his career, he was responsible for product design and development at BMW and Porsche, two companies that have long since established reputations for bringing excitement to the act of driving from A to B. His work includes one of the most adored editions of the Porsche 911 in that car’s venerable history, the 993, the last of an air-cooled generation that’s since been confined to the ether of nostalgia. I have a theory (completely unconfirmed) that Dr. Bez wanted a car with which to take his family on road trips—and he wanted that car to bear the Aston Martin logo. To follow this line of speculative thinking, the company’s design and engineering team then set about creating a four-door car that offered the same level of style and performance as their line of exceptional 2+2 coupes and convertibles: the V8 Vantage, DB9, and DBS. In the Rapide, they have succeeded in doing just that—and Dr. Bez is very pleased with the outcome. No wonder. First of all, the Rapide is absolutely stunning from every angle. The profile, of course, reveals the four doors and the fact that the car is slightly longer than its siblings. But the expert hand of design director Marek Reichman has given the car a sensuous, coupe-like shape that is the very definition of pure, unmitigated genius. The average sports coupe, including those in the Aston Martin fleet, is often described as a “2+2”—meaning there’s room for two adults plus two “smaller” passengers. But the truth is, those two smaller passengers need to be really small—and inanimate—in order to fit in the back seat. In contrast, the Rapide is a true 2+2 in a world full of fakes. The interior environment in the back seat is also equally as engaging as the front seat. The swan-wing doors open wide to promote ease of access. The sporty buckets do a fantastic job of cradling occupants, and thoughtful features such as dedicated climate control switches, seatback pockets, and an optional rear-seat DVD entertainment system complete the picture. 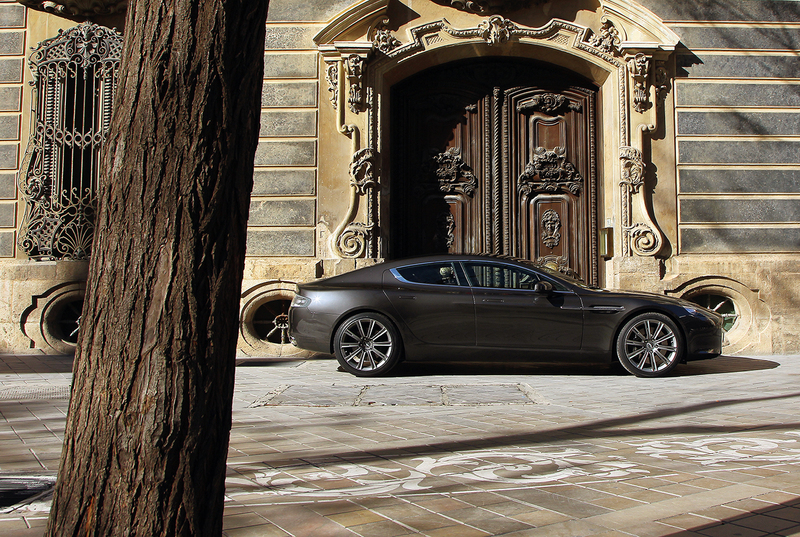 The Aston Martin Rapide is absolutely stunning from every angle. The car has a sensuous, coupe-like shape that is the very definition of pure, unmitigated genius. The back seat may not be the most comfortable place to camp out during a trek from Vancouver to Halifax, but it’s beautifully suited to four-up runs of shorter distances and reasonable for longer commutes, depending on passenger dimensions. 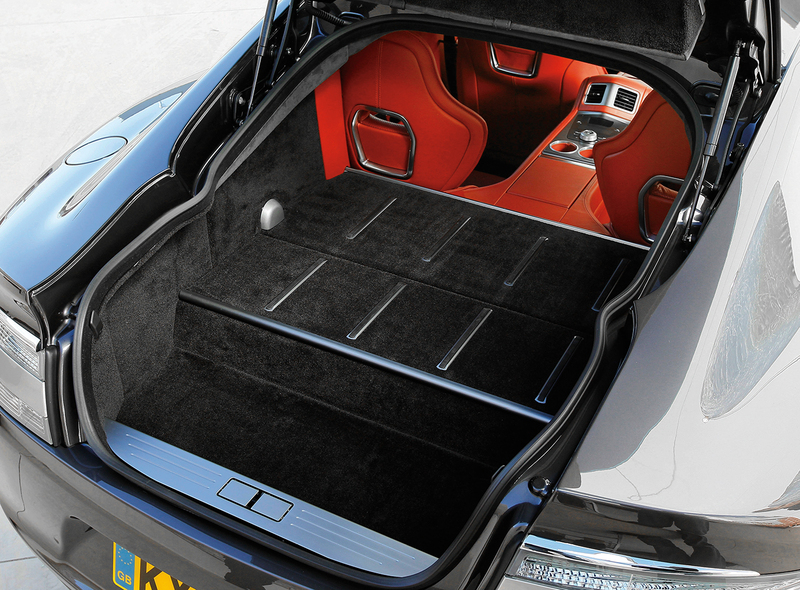 The Rapide also offers a decent amount of versatility: the rear seats fold down to create a 886-litre cargo area (up from 317 litres with the seats up), complete with a flat loading surface and skid plates. There’s also a divider that can be folded down to allow rear-seat passengers access to the luggage compartment. Nice touches, all. Of course, the front seating area continues the theme, with surfaces covered in meticulously hand-stitched leather and hand-hammered metal. The driver and front-seat passenger have their own individual pods, creating a feel that is both cozy and racy at the same time. More importantly, the level of luxury in the Rapide sets new standards for the manufacturer. There’s no question that the Aston Martin Rapide is not as commodious or user-friendly as the average large luxury sedan. But then again, the average large luxury sedan is nowhere near as fun to drive. To be fair, while the Rapide may look like the fastest car on the planet, it is not the fastest car on the planet. The new sports coupe employs a 6.0-litre V12, with the engine generating 470 horsepower and 443 lb-ft of torque. Still, the Rapide remains true to its speedy name: the sprint from 0–100 kilometres an hour takes an estimated 5.3 seconds, a none-too-shabby mark that leaves room in the lineup for an inevitable faster version of the car, although this is something the powers that be at Aston Martin will not admit to. Yet. The power is transmitted with a six-speed Touchtronic automatic that allows for manual shifts via steering column–mounted, leather-trimmed, magnesium paddle shifters. The transmission, the only one available for the Rapide, is engaged using buttons set into the dashboard and can, of course, shift itself automatically. The sports mode setting triggers more aggressive shift patterns and more forceful automatic throttle blipping on downshifts. While the manufacturer isn’t working with the latest dual-clutch technology here, this automatic delivers shifts that are nevertheless very quick and decidedly smooth. For all of these great mechanical qualities, the car’s one true strength is its agility. The Rapide displays incredible balance when transitioning from one corner to the next on even the most challenging of roads. The racing-derived double-wishbone suspension and adaptive damping system proves adept at absorbing bumps and carving turns. In fact, it’s not surprising that Aston Martin has elected to race the car at the Nürburgring—it’s that good. Aston Martin has referred to the Rapide as “the most elegant four-door sports car in the world.” Truer words were never spoken; the sports coupe is flat-out gorgeous, its driving dynamics are superb, and it boasts no small amount of practicality to boot. At long last, Dr. Ulrich Bez has his dream car—and so do countless others.